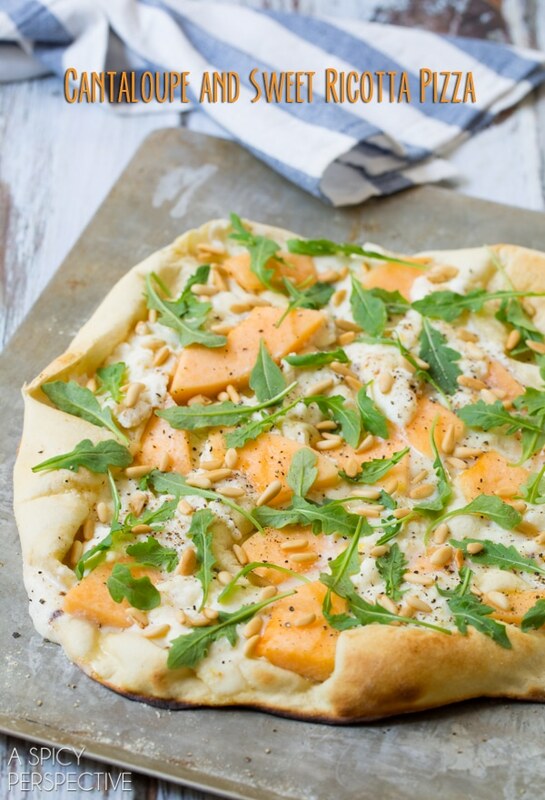 Cantaloupe and Sweet Ricotta Pizza with Pine Nuts! This dessert pizza is loaded with flavor and visual appeal. 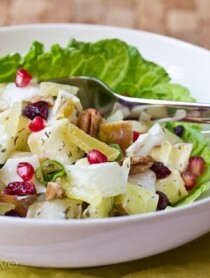 It also makes a fabulous summer side dish. After 3 fabulous weeks in Italy our Estate d’Italia (Summer of Italy) has come to an end… At least the physical travel portion. But don’t worry. If you’ve loved all the Italian-inspired recipes, and the fun shots on our Instagram Feed, we’ve got much more coming. Over the next few weeks we will share multiple travel posts featuring places we visited in Italy (places you might want to visit) with gorgeous visuals and tips on Italian travel. We also learned a thing or two at various cooking classes around Italy. We will have some very authentic Italian dishes coming your way in the near future. And lots of fun stories. In the meantime, I’ve got a fun Italianish dessertish pizza to share with you today. This grilled dessert pizza is sweet and fruity with nutty crunch from the pine nuts and a peppery bite from the fresh arugula sprinkled over the top. It’s sort of a dessert pizza (but not as sweet as most dessert pizza recipes) and sort of a side dish. You could serve this pizza with grilled chicken and a big summer salad for a fantastic summer meal. 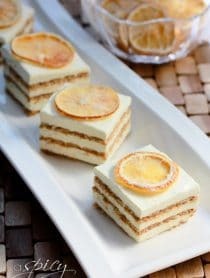 Or add it to the end of any meal as a whimsical sweet treat! Either way, there’s nothing as nice as a fresh hot bubbly crust loaded with warm sweet cantaloupe and creamy melty ricotta cheese. Make sure to check in next week for our first Italy travel post. It will be molto meraviglioso! Place the pizza dough ball in a large oiled bowl, cover with plastic wrap and allow it to rise until double in size, 1 1/2 – 2 hours. 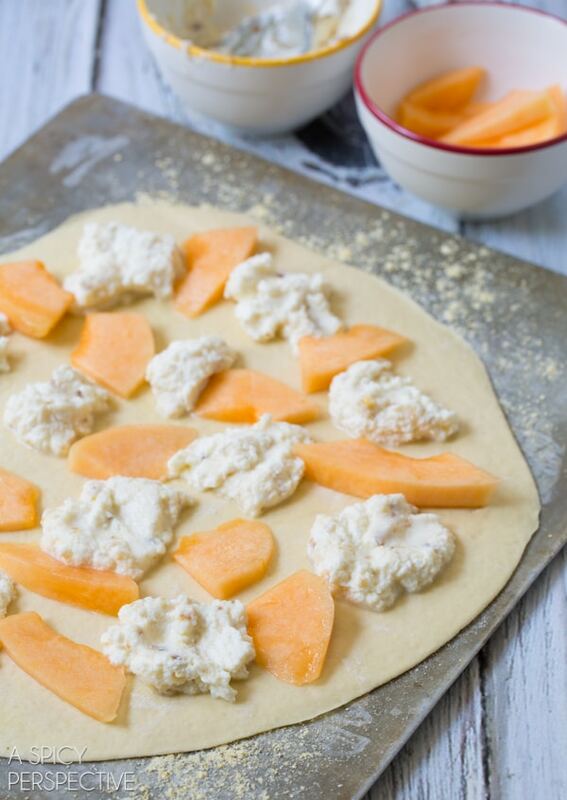 Mix the ricotta cheese and honey in a small bowl Dollop the ricotta around the surface of the pizza crust, then top it with pieces of cantaloupe. Once the grill reaches at least 600 degrees F, shake the baking sheet to loosen the pizza crust and slide it onto the baking stone. Cover and grill for 2-5 minutes. Check your pizza after 2-3 minutes. If the grill is really hot, it will cook extremely fast. You don’t want to burn the bottom! Use a large spatula to loosen the pizza and move it back onto the baking sheet. Then top it with pine nuts, fresh arugula, and a light sprinkle of salt. Cut and serve warm! NOTE: You can achieve similar results at the highest temperature in your oven. Yet, grills usually can reach higher temperatures than ovens, making this cooking method more like a wood-burning pizza oven. So creative! I can’t wait to try it! What a unique flavor combo. Sounds amazing! this is my kind of pizza! 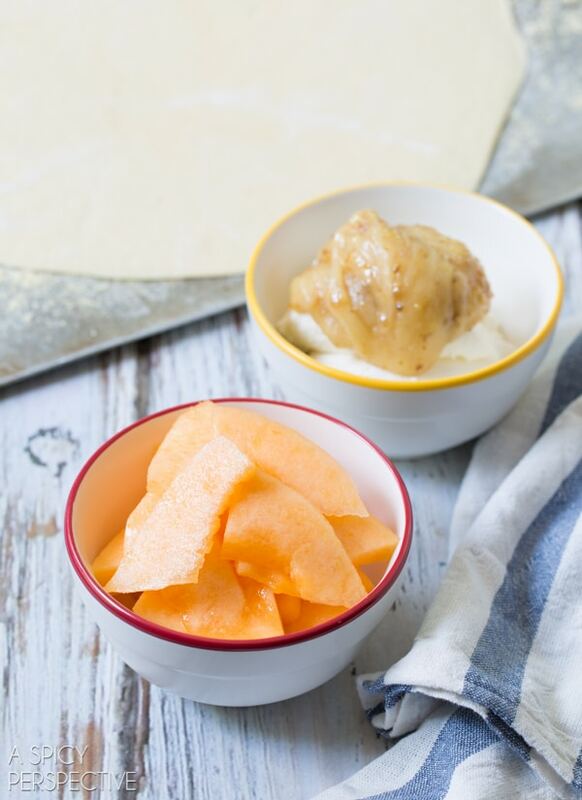 what an interesting idea to use cantaloupe.. definitely something i need to try! 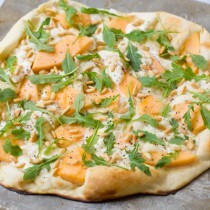 Love this pizza, the ricotta and pine nuts sound so good with the cantaloupe! So fresh and delicious! I love this! I love the idea for this pizza, Sommer! And it’s grilled so bonus points to you. I love this subtley sweet pizza, I would throw grilled chicken right on it. Cantaloupe on a pizzzzzza? Genius! I so can’t wait for your recaps! What a fun flavor combination for pizza! What a fun pizza combo! I cannot wait to hear all about trip!! Very excited! Also, this pizza! What a great idea to add cantaloup! Sounds awesome! 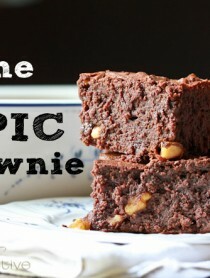 What a unique recipe. It looks and sounds delicious. I can’t wait to hear about your travels. Welcome home! Soooo intrigued with this! Love all of these flavors! This is so gorgeous Sommer and totally pays homage to all that amazing melon over there- just love it! 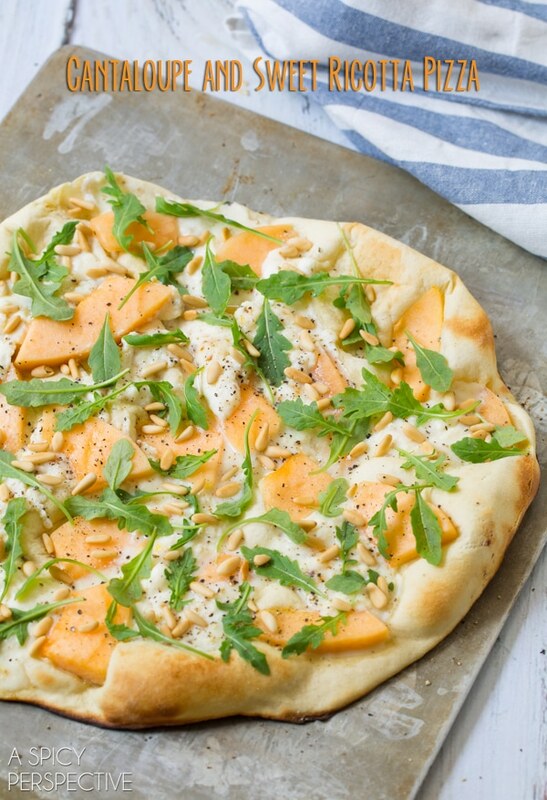 I’ve never had cantaloupe on a pizza ~ great idea!